CREIGHTON, JOHN, office holder, militia officer, judge, and politician; b. 1721 in Glastonbury, England; m. first Maria; m. secondly 8 Dec. 1760 Lucy Clapp in Lunenburg, N.S., and they had three sons and three daughters; d. there 8 Nov. 1807. 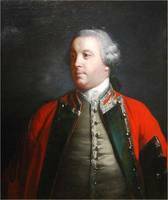 John Creighton began his career as a lieutenant in the dragoons, and was present at the battle of Fontenoy in 1745, but in 1749 he went on half pay. That year he, his wife, and two servants accompanied Edward Cornwallis* to Nova Scotia, sailing on board the Charlton. Although in comfortable circumstances, he apparently welcomed the opportunity to go to Mirligueche (Lunenburg) with the Germans and Swiss in 1753, both to secure challenging employment and to add to his income. Intending that he play a leading role in the founding and development of the settlement, the authorities in Halifax made him a justice of the peace and militia captain before he left there. In the latter capacity he commanded the settlers in Creighton’s division, one of the six divisions of Lunenburg, and thus to this day all deeds relating to lands given to settlers within this division bear his name. In the early years of the settlement Creighton served on the commission for laying out and assigning 300-acre lots; in 1753 he was gazetted as a judge of the Inferior Court of Common Pleas, although he did not actually serve in that capacity until the court was created seven years later; in June 1755 he reported personally to the Council about the victualling of the settlement; in 1776 he became judge of the Probate Court. These were some of the multiplicity of duties which the authorities at Halifax conferred on someone they trusted. In return, he was among the few who were permitted to send men to Grand Pré to procure cattle and horses after the expulsion of the Acadians in 1755. Trust in Creighton may have developed more slowly among the Germans and Swiss, since in the election to the first house of assembly in 1758 he received but a single vote; between 1770 and 1775, however, he served as an assemblyman for Lunenburg County. Although Governor Lord William Campbell* recommended his appointment to the Council as early as 1767, it was not until 6 May 1775, after Governor Francis Legge* had described him as “a man of good character & understanding, in easy circumstances, well affected to His Majesty,” that he was finally admitted. But it was folly to hope that the Council could be anything other than a Halifax body in those days, communications being what they were, and over the next 13 years Creighton attended only a handful of its meetings. He was there for the last time on 6 Oct. 1785, before being superseded on 3 Jan. 1788 for inability to attend. Creighton is best known for his conduct during the American privateer raid of 1 July 1782 on Lunenburg. Some 90 men from several vessels landed near the town, took the small garrison of regulars prisoner, and then began to pillage. As a lieutenant-colonel in the militia, Creighton occupied the blockhouse and wounded three of the enemy before being captured with two of his men. The town itself was largely spared, but Creighton’s belongings were not. His house and its effects were burned, although his black servant Silvia, who protected his son with her body, saved some valuable coins and plate by lowering them into the well. The assembly later voted to pay Creighton and his fellow captives £109 19s. in compensation. In social standing Creighton was probably unique among Lunenburgers. His eldest son, John, was educated in England and served in the British army, as did his youngest son, Joseph, for whom Creighton bought a captaincy costing £950. 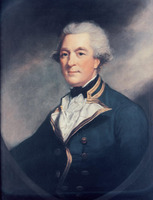 His sons-in-law Hibbert Newton Binney and Lewis Morris Wilkins*, who married his daughters Lucy and Sarah, were both members of the Halifax establishment, of which Creighton was in effect the Lunenburg representative. Outside Nova Scotia his major holding was £9,000 in three per cent Consols, which were to bring his widow an annual net income of about £245. His descendants have held a wide variety of offices ranging from that of sheriff to that of councillor in every generation to the present. PANS, MG 4, 92: 1–10 (typescript). Private arch., Mrs D. Burke (Lunenburg, N.S. ), H. W. Hewitt, “History of the town of Lunenburg” (typescript; photocopy at PANS). Bell, Foreign Protestants, 410; 415, n.11a; 488; 491; 575, n.5a. M. B. DesBrisay, History of the county of Lunenburg (2nd ed., Toronto, 1895), 62–68. J. Murray Beck, “CREIGHTON, JOHN (1721-1807),” in Dictionary of Canadian Biography, vol. 5, University of Toronto/Université Laval, 2003–, accessed April 24, 2019, http://www.biographi.ca/en/bio/creighton_john_1721_1807_5E.html.